Robelle and MPE have practically grown up together. 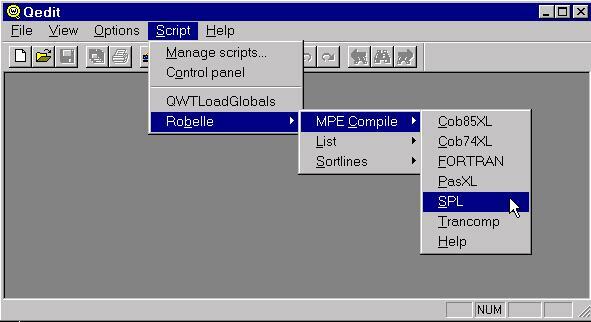 Introduced 20 years ago, Robelle's Qedit for MPE has been the editor of choice for programmers and developers. 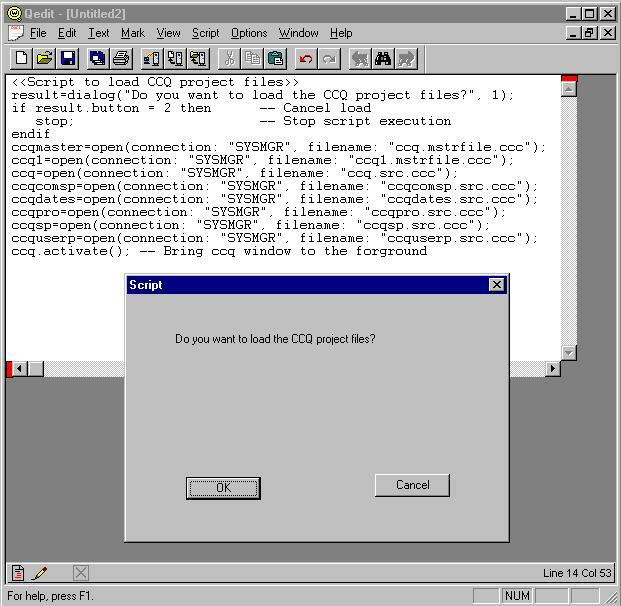 In the mid-1990s, Qedit was ported to HP-UX at about the same time more and more traditional MPE shops started to find HP-UX boxes crowding into their datacenters. 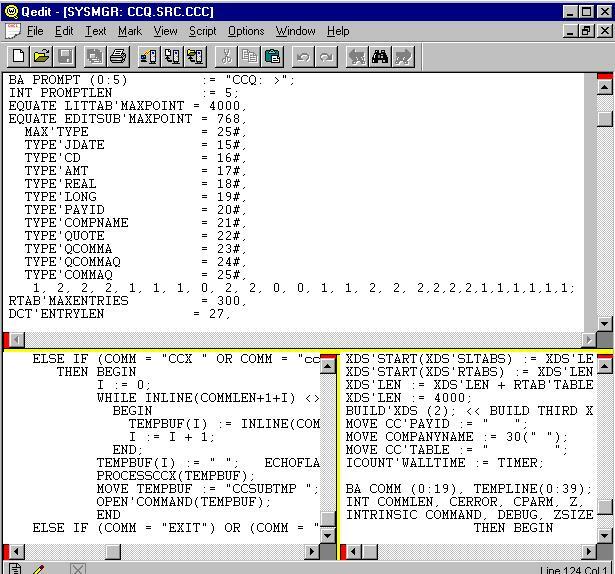 In the late '90s, as Windows NT started making inroads, Robelle came out with Qedit for Windows, a client-server Windows-standard editor for Windows that allows you to edit local or remote Windows files, MPE-based files and HP-UX files -- even simultaneously if you like, cutting and pasting between documents you are editing and even between other Windows-compliant applications. Version 4.9 of Qedit for Windows, introduced this May, adds the Qedit for Windows Scripting Language (QSL) and Host Commands interface. For the international market, the client software is available in a French language version. I've installed a lot of software over the years on both HP e3000s and Windows-based PCs. The Qedit for Windows install is the best and easiest install I've ever done on either platform. First, on the Windows platform, you are not required to exit all your open Windows programs, nor do you have to reboot your PC to "finish the install." As someone who invariably has 8-12 windows open all the time, thank you Robelle. On the server side, you can install the server piece from your desktop PC's CD-ROM drive as long as you have FTP configured and available on your HP e3000 server and can connect to it. This is very handy if your server is farther away than just down the hall. The install on HP-UX is slightly more complex (snicker, snicker) and requires the launching of a continuously running daemon. www.robelle.com Web site that includes the QSL Scripting Library of useful and/or interesting scripts. It also serves as a handy source of examples when learning to write scripts. The documentation contains numerous screen shots and examples, ranking it among the best I've ever seen. Robelle appears to have packed the entire user manual, including screen shots, and then some, into the Windows Help file for the product. All three manuals are downloadable in PDF format from the Robelle Web site. QWIN is a little unusual, because instead of the typical server job, QWIN uses Remote Process Management (RPM) on the HP e3000 to create a session that runs the server process. The good news is this session does not count against your user license, an important consideration if you have several developers working on an eight-user license, or even a 20-user license, machine. It does count against the session limit, so you may have to adjust it if multiple people are using QWIN simultaneously. Host files stay resident on the host HP e3000 or HP-UX system, with just those parts of a file you are viewing or editing sent across the wire to the QWIN client. Version 4.6 of QWIN was reviewed by this publication in January 1998, so I will just give a quick overview of key product features, commenting more in depth on the features new to version 4.9. Consistent interface to all platforms; one editor for Windows, MPE and HP-UX files with the standard Windows look and feel means a short learning curve. Multiple independent views of a document (vertical and/or horizontal); e.g. look at the program declarations in one window at the same time you are looking at the source in another window. Windows-type editing plus a number of features particularly useful in programming, such as rectangular selection: selecting text across multiple columns and multiple lines. Print to any local or host printer. Does not require a terminal emulator. Uses normal MPE security to control file access. Remembers last 20 files worked on for quick access. Can edit files up to 99,999,999 lines long and 8172 characters wide. Is Posix aware on MPE and can edit bytestream files. Edit multiple documents simultaneously with both horizontal and vertical tiling supported. Copy, cut and paste between documents, even if on different systems. Very fast and powerful search with wildcard pattern matching. Language support such as automatic source tag insertion and line number preservation for COBOL, one click opening of INCLUDE files in a separate window and auto-indent. Remembers file-specific attributes so that when you re-open a file your are right where you left off. Prevents overwrites by warning you if the file has been modified by someone else when you go to save it. QWIN does not have source control or source project management features built in, though you can do some crude project organization by appropriately defining connections. Nor does it have any hooks into existing software for source control or source project management. You will have to decide if this is important to you. The Host Commands feature allows you to interact directly with the host. In the case of MPE, the QWIN server creates an instance of the CI as a child process, allowing you to do pretty much anything you can do, except screen formatting, from a separate terminal or terminal emulator window. Each command is executed by itself in its own CI process. For multiple commands that are logically connected, just create a document and use the "Run as host" command. You can use this feature to invoke the compiler of your choice, but there is a better way. QSL is targeted mostly at the power user, someone who spends most of the day writing code. Of course Robelle makes it easy to share scripts so you only need one person who can comfortably work with QSL. With a 172-page manual devoted solely to QSL, it will be hard to do it justice here. QSL is a very powerful scripting language for QWIN. Think VBScript's capabilities, and you'll have an idea what QSL looks like. Of course this means that if you have no exposure to object-oriented languages, QSL may look a little daunting at first. Not to worry though, since the manual contains numerous descriptive examples and the Robelle Web site contains many scripts you can use directly and as templates to write your own scripts. Copy a list of files. Do a regular expression search of any file. Append text to either all lines or selected lines in the active document. Sort the selected lines in ascending or descending order. List all lines containing a string, a regular expression or pattern, searching the current file only or scan all $include files. Compile the current MPE document using one of the host compilers. Just to show you that anyone can quickly start using QSL, if properly motivated, I wrote the script in Figure 3 to load all the associated source files for a project and then bring the primary file to the foreground. Figure 4 shows the result. Piece of cake. Figure 3: A simple QWIN script to load all files and bring the primary file to the foreground. Figure 4: The results of the QWIN script to load all files and bring the primary file to the foreground. Qedit for Windows is an extremely powerful but easy-to-learn tool for anyone who routinely edits host-based files on MPE/iX or HP-UX systems. It brings full Windows GUI capabilities to host file editing. QWIN beats EDITOR, VI and even, in my opinion, classic Qedit when it comes to productivity and ease of use. The new scripting language, QSL, adds powerful customization and batch editing features to an already robust editor. I liked this version of Qedit for Windows, but any decision on an editor that you may spend much of your day using is a very personal one. Therefore, I strongly suggest you go to the Robelle Web site and browse through the copious information available on Qedit for Windows. You should be able to tell in 15 to 20 minutes if this is the product for you. If you think it might be, order up a copy of the demo on the Web site. John Burke is the editor of the NewsWire's HiddenValue and net.digest columns and has more than 20 years' experience managing HP 3000s. Qedit for Windows is a client-server editor for Windows that allows you to edit local or remote Windows files, MPE-based files and HP-UX files. Version 4.9 adds the Qedit for Windows Scripting Language (QSL) and Host Commands interface. 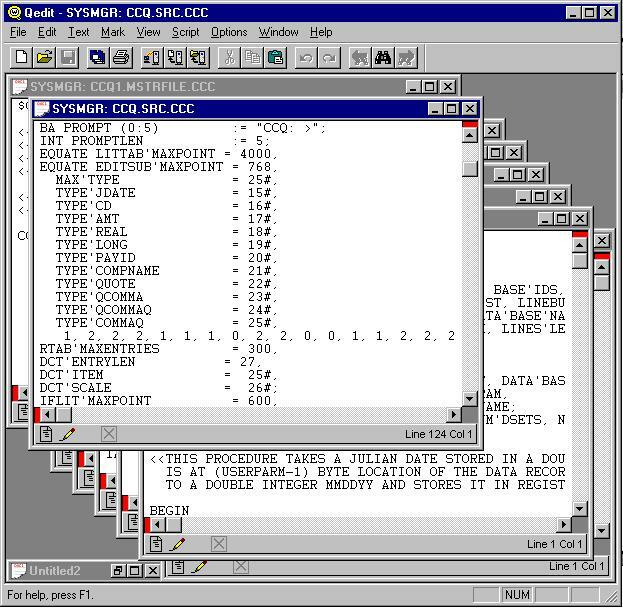 The Qedit for Windows client runs on Windows 95, 98 and NT. The server software runs on all supported versions of MPE/iX or HP-UX. Qedit for Windows (QWIN) requires a true TCP/IP connection to the host. If you want to use QWIN to access your servers across the Internet, you may have to reconfigure your firewall or router. QWIN does not support the SOCKS standard proxy server sometimes used in corporate intranets to control access to the Internet. The Qedit Server Module (MPE or HP-UX) is priced at $1,000 for the first system and $500 for each subsequent system. Client licenses are priced on a number of named users basis. Secondary copies of the client software are specifically permitted for a named user's home or portable PC. The per-client cost ranges from $200 each for 1-5 licenses to $100 each for 100 or more licenses. Yearly maintenance is priced at 20 percent of current license fees. A 30-day trial version is available upon request either by CD-ROM or downloadable from the Internet.